Following a successful trial in semester two, 2014-15, the Library has subscribed to Political Science Complete a major database in the areas of politics and international relations. Political Science Complete provides full text for more than 520 journals, and indexing and abstracts for over 2,900 titles. 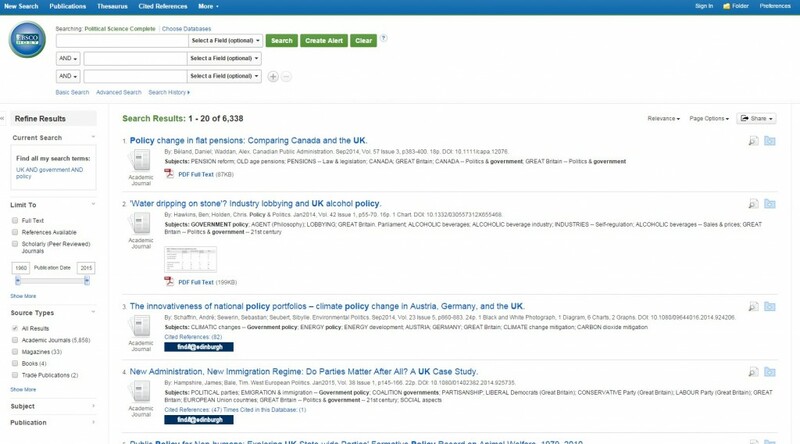 The database also features over 340 full-text reference books and monographs, and over 36,000 full-text conference papers, including those of the International Political Science Association. Political Science Complete provides extensive coverage of global political topics with a worldwide focus, reflecting the globalisation of contemporary political discourse. Subject coverage includes comparative politics, humanitarian issues, international relations, law and legislation, non-governmental organisations and political theory. You can access Political Science Complete via the Databases A-Z list on the Library website. Or via some of the Databases by subject pages such as Politics, International Relations and Social Policy. Access is only available to students and staff at University of Edinburgh. This entry was posted in Library, Library resources and tagged databases, international relations, new, online resources, politics, Social & Political Sciences by spslibrarian. Bookmark the permalink.